In a letter, Pichai said free flow of data with focus on user privacy and security will encourage start-ups to expand globally and encourage international companies to contribute to India’s digital economy. Google chief executive officer Sundar Pichai has urged electronics and IT minister Ravi Shankar Prasad to allow free flow of data across borders, which the India-born executive feels will boost India’s digital economy. Sources said Pichai, in a letter to the minister last week, reiterated Google’s commitment to being part of the India’s growth story. 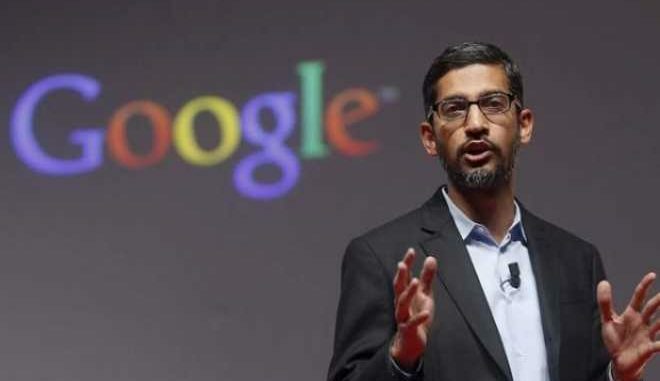 A senior government official said: “Pichai said he appreciates the government’s efforts in creating a conducive business environment in India. In the letter, he urged that free flow of data across borders, with focus on user privacy and security, will encourage start-ups to innovate and expand globally and encourage global companies to contribute to India’s digital economy”. Pichai’s suggestion comes within days of Prasad’s visit to San Francisco last month, where he met heads of tech companies, including Pichai. Besides, inviting the US tech companies to deepen their involvement with India’s economic journey, the minister had also apprised them about the emerging data security issues in India and has stressed that government was cognisant of the need to strike a balance between data availability, data anonymity, data innovation, data security and data privacy. During Prasad’s meeting with Pichai in the US, on August 29, the minister was briefed about Google’s plans for India in the areas of connectivity, Indic languages, artificial intelligence, machine learning and capacity building of start-ups and SMBs. The minister informed Pichai that digital payments have played a pivotal role in the growth of ‘Digital India’ and companies like Google could play an important role in this direction. On cross-border flow of data, tech companies including Google are of the view that storing data within the country could have an adverse socio-economic impact on innovation, information and technology access and trade. Software Freedom Law Center’s legal director Prasanth Sugathan recently told FE that with the possible exception of government data, especially data that could have national security implications, there should be no general requirement to store any kind of data locally. “Data localisation requirements pose an additional and unnecessary burden on service providers for no apparent advantage. Small and medium-sized enterprises would particularly face the brunt of such requirements,” he said.